The morning has started cold. Temperature is 9 degrees Fahrenheit as I leave my house at 4:45am to drive to work at Denver International Airport. I am a supervisor in the FAA approach control. I need to get to work by 5:30 to set the arrival flow for all the airliners inbound from the east coast. But, my mind is elsewhere. 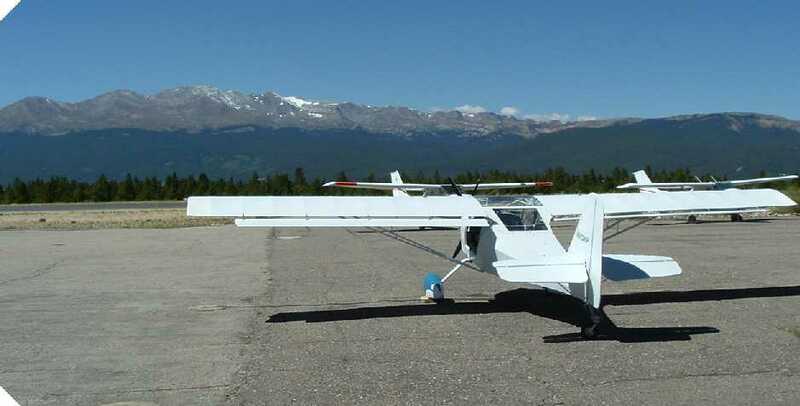 I am thinking of the Kitfox Series 6 that I have been building for the last two years. It is sitting in a hangar at FTG Front Range airport - about seven miles away from DEN and tucked into a corner below the Class B airspace. N913KF had been issued her airworthiness certificate on 11/10/03. About five hours were showing on the Hobbs meter as a result of engine runup and taxi testing. Would today be the day? I felt that the aircraft was ready, but was I? 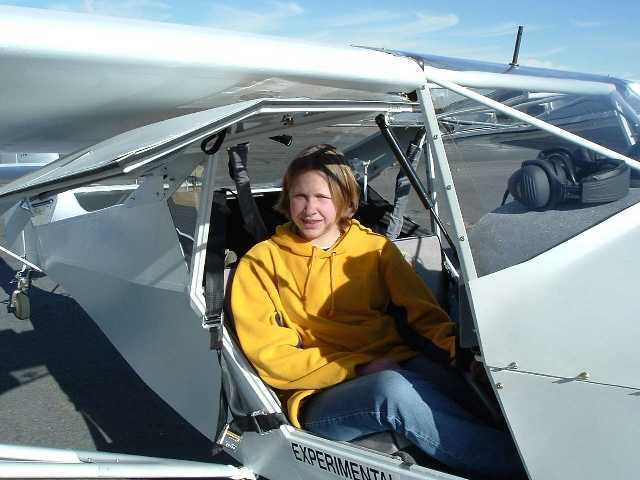 I had never been airborne in a Kitfox. I have logged over 4500 hours in the last 27 years, but all of it was in production aircraft. 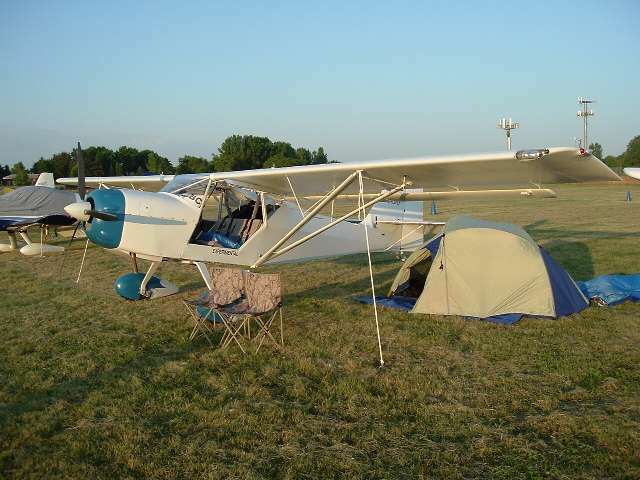 I have been keeping current in an Aeronca Champ while I have been building the Kitfox. I felt capable. I had consulted with my EAA chapter flight advisor. I had confidence in the aircraft construction and rigging after the taxi tests, but that first flight in a new aircraft is an awfully big step. At the approach control, I check the weather, NOTAMS, and airport conditions before setting the day's arrival rate. It is good VFR, only a slight breeze from the southeast, and all the runways and taxiways are open. I call Denver Center and tell them to give me a flow for four runways, visual approaches, land south and east with no restrictions. I can almost see the Traffic Management Coordinator smile - even though he is 60 miles away in Longmont Colorado. I have just given him the permission to throw 160 airplanes per hour at me and my approach controllers. No other airport in the world can eat aluminum like DEN can! The folks at Denver Center know that it will be impossible for them to find enough aircraft to meet this demand, but they will certainly come close for short periods. I can only imagine how the airlines' bean counters will be smiling - along with the 30,000 people that will travel through DEN today without any delays or cancellations. I think to myself - gee, this decision made by me, a lowly government employee, will have a positive economic impact on a whole bunch of people today. I hope that they keep paying their taxes so I can keep drawing my salary. I also hope to make it hard on the flight crews to try and use the excuse "Ladies and gentlemen, we have an ATC delay...." There's nothing like good VFR to make all our lives easier. And these light winds are favorable for a taildragger.... Enough, back to business. The first morning inbound rush is down and at the gates when I am joined in the Tracon by another supervisor. Would he mind if I skipped out today and went flying? He is agreeable, but the 9 degree temperature makes the thought a little uncomfortable. I decide to get a session of proficiency time working final approach during the next rush. Maybe it will warm up. I key up 123.85, set my radar scope the way that I like it and buckle in. Final approach can be like a roller coaster ride. There are times of great buildup followed by a wild ride until it ends. Unlike a video game, you can't hit pause and you can't ask anyone to stop. Just like they tell you at the carnival "keep your hands and feet inside the ride until it comes to a complete stop." Away we go. "United 44 heavy, approach, reduce speed to 170 then descend and maintain 8,000." "Skywest 7036 turn right heading 080, traffic two o'clock 3 miles on final a Boeing 737. Report traffic in sight." "Frontier 583 turn right heading 140, maintain 170 knots to JETSN, clear for visual approach runway 16 right." "United 1403 contact tower won tree fife point tree (135.3) So long." It is a pretty smooth session today. My turns are timely, spacing is good, the lineup is aesthetically pleasing on the radar scope. I am feeling pretty self confident. What is the wind? One six zero at eight - that is a fine wind for a first flight. I'm outta here! As the last airliners are sent to tower, I combine my radar position to another controller, sign for the leave, and drive to FTG. This will be the day after all. The temperature is now about 35 and N913KF does not protest as I pull the cowl off and give a preflight as if my life depended on it, because it does. The airport Crash-Fire-Rescue crew comes to the hangar at my invitation as I explain what I am going to do, show them how to work the door latches, and where the master and ignition switches are located. They offer to stand by for the flight and I heartily agree. Self preservation has a way of hedging all bets. Two friends from work drive up to witness the event. I am not sure if they are here for support or to manage a betting pool whose outcome is determined by my ultimate success. The Rotax 912S starts in the cold air, but is reluctant to smooth out for the first 30 seconds. Finally, it purrs its cadence and I start the long taxi to runway 17. By the time I get to the runway, the engine temperatures are normal and everything feels right. Out come the checklists as I prepare to make my own personal history. Finally, it is time. No excuses. In the words of astronaut Gus Grissom I mumble to myself the test pilot's prayer - "O Lord, please don't let me f*** up!" The throttle moves forward. Before I can get it to the stop, the tail has come up. Oh Yah!! Tracking is straight as the airplane very quickly gets light on the wheels. Now, according to my script, I am supposed to make note of the indicated airspeed so that I will have it as a basis later for the landing approach. I confess, I missed it. By the time I look down at the airspeed, I am already in the air! Ed Downs was right - this thing is really a high performance airplane in disguise. I put the nose in what I consider to be a comfortable spot for climb and glance at the speed. I am already up to 80 mph. Unfortunately, I have to level off to stay out of the Class B airspace, but it certainly feels as if it want to keep on climbing. I fly a rectangular pattern around the airport and check the control responses. I had only used a very little bit of trim adjustment from the measured spot detailed in the construction manual. That was good. Control response incredibly light and effective - much more so than the Aeronca. Rudder authority is good. I let go of the stick to see if the wing rigging is proper. It stays level hands off. "Remember to breathe" the Flight advisor had told me. I do - through a huge smile. I think to myself "I built this thing and it is flying!" I am experiencing no fear, no apprehension, and no desire to return to earth. But, my flight plan says that I must. After 1/2 hour it is time to try the first landing. As I slow in the pattern, the control response feels solid. I'll land on runway 17. There is no crosswind and the runway is 8000 feet long, so there is no reason to try and put it on the numbers. I aim for a spot 1500 feet down, carry a little extra speed until I am in the flare, and close the throttle. I ended up with the prettiest little three point landing that you've ever seen. There was no tendency to swerve or fishtail, and with minimal braking I was at a stop in about 500 feet. I think that I am in love. So, now I have 36 minutes of Kitfox time in my log book. I have thoroughly enjoyed the building and am looking forward to the flying. My personal euphoria is exhilarating. All is right with the world. As so may others on this list have stated... Blue Skies. Honors for the first passenger to ride in N913KF went to my daughter Sarah. She was not at all tentative until I pointed out the 'EXPERIMENTAL' label on the fuselage. Then I told her that she was part of the experiment. I'm not sure she trusted me after that. 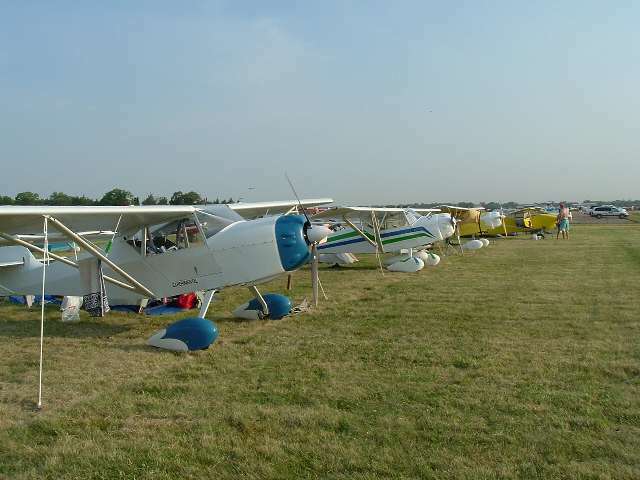 Who can build an airplane without wanting to make the trip to Experimental Aviation Mecca - Oshkosh, WI. I made the trek (for the first time?) in 2004. It took some imagination to load camping gear for a week, clothes, fuel, myself, and my 15 year old son into the Series 6, but we fit! I sure was happy for that 760 pound useful load. I flew from Colorado to Wisconsin with two other Kitfoxes. Stan Specht and James Johnson each had their Classic IV's. We got a late start due to weather. We fueled once in eastern Nebraska. We arrived as the last airplanes to land prior to airport closure on Sunday night. The flight out involved some beautiful flying above some broken cumulus clouds. We ended up cruising at 11,500' to avoid the bumps. The return took us through some marginal VFR in western Wisconsin, but clear skies after the Mississippi River. After a full day in the cockpit, we made it home in time for dinner. 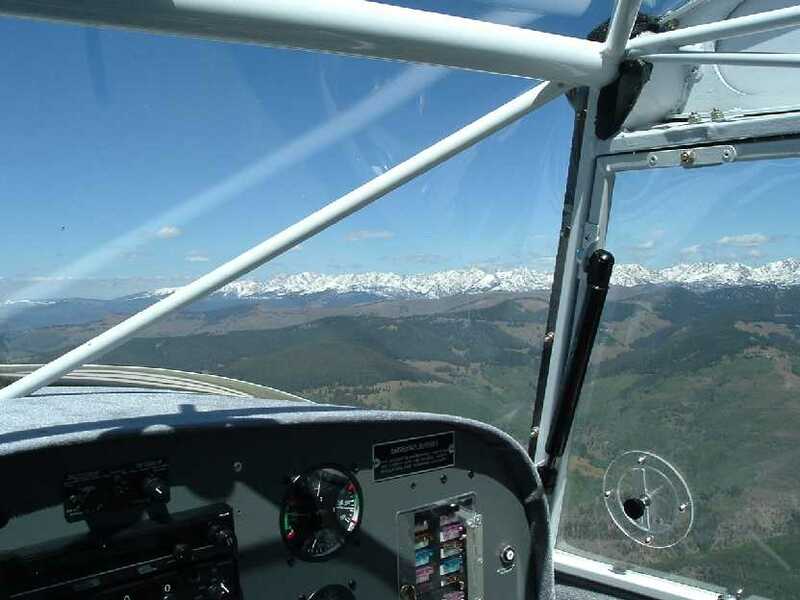 Leadville, Colorado boasts the country's highest airport with a field elevation of 9927'. Naturally, the Kitfox had to visit this playground. This flight took place on Labor Day, 2004. Fresh snow had fallen on the mountains the day before. The view shown here is looking east at the continental divide from 12,500' while enroute from LXV to EGE.